New MODEL KIT with LASER CUT BALSA PARTS. 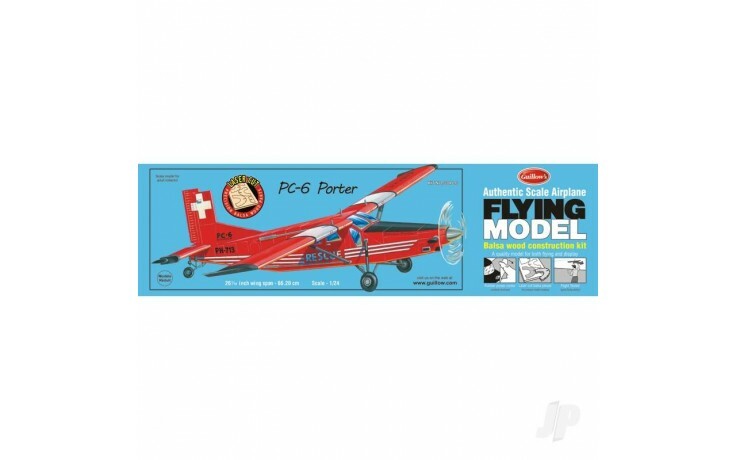 The PC-6 Porter is the worlds leading Short Take-Off and Landing (STOL) airplane making it extremely versatile in all weather and terrain conditions. Its used in many different operations such as search and rescue, material transport, and parachuting excursions - a truly rugged utility aircraft. This Guillow creation is a faithful replica of the real plane, designed for ease of assembly and flight stability. A beautiful model that is a great flying kit, designed for lightweight, ease of assembly and flight stability. These popular private planes are still in use today by many private pilots. Whether built for scale or contest flying, the balsa wood airplanes in this series represent the finest in design and flight capability. Each can be flown using either the rubber motor included in the kit or converted to gas engine or electric motor (instructions for using electric power supplied in kits).